"Excellent service to boost online positive reviews by customers and head off negative ones! 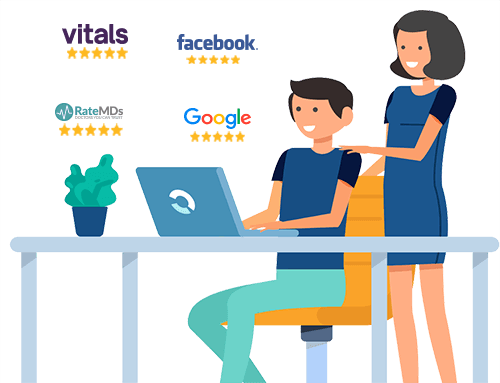 We went from very few reviews from years ago, to regular 5-star reviews in excess of the entire volume of prior reviews, within a few months." "Its a great product to get honest feedback from my patients and helps to improve my services, based on it. The best are the ones who didn't have a good experience - they can be engaged immediately to understand what went wrong - and corrective measures can be taken." "This is a great way to get feedback, intercept those few bad reviews and have an opportunity to make things right for our customers!" "Excellent product, user friendly and prompt response from the support guys (Casey) for a fraction of price from competition. Very happy with their service." "Ease of use of the software and short learning curve so this I like." "What a great tool to manage the online reputation of my business. I love that Repugen is so easy to use and is a great way for me hear what my client's have to say, so that I can assure their satisfaction. The reporting tools Repugen offers really helps me make sense of review data." "Repugen is particularly useful in self regulation of doctors. Before I started using RepuGen, I was living in an aura that all my patients are happy that's why my practice is growing well YoY. With RepuGen I found that almost 97% of my patients are happy, but it's the three percent who were unhappy, helped me to greatly improve my attitude to patients. I started taking note of genuine negative feedbacks and have started to improve on those aspects. On doing so, am so glad that only within a few weeks - have been able to further improve on my patient happiness index. When a patient walks out of the clinic, we are in dark how they felt about the treatment. So this exercise gives an opportunity to the ones who are willing to give constructive feedback, and believe me there are many of them out there who are your well wishers and and willing to help you. Why not take it from them :) "